The number of former Eton pupils in Prime Minister David Cameron's inner circle is "ridiculous", Education Secretary Michael Gove has said. Mr Cameron is himself an Old Etonian, as is chief of staff Ed Llewellyn and minister for government policy Oliver Letwin, among others. "I don't know where you can find some such similar situation in a developed economy," he told the Financial Times. Labour said it was a reflection of the Conservative Party under Mr Cameron. In an interview in Saturday's FT, the education secretary said: "It doesn't make me feel personally uncomfortable, because I like each of the individuals concerned. "But it's ridiculous. I don't know where you can find a similar situation in any other developed economy." The FT said Mr Gove was reflecting on the number of those close to the prime minister who were educated, like Mr Cameron, at the boys' independent school. Among the other Old Etonians in Mr Cameron's inner circle are policy unit head Jo Johnson and Chancellor George Osborne's chief economic adviser, Rupert Harrison. And the prestigious school has produced 19 prime ministers of Great Britain, one of Northern Ireland, and also educated the former prime minister of Thailand, Abhisit Vejjajiva. It would be wrong to blame the individuals concerned, said Mr Gove, but he added: "It's a function of the fact that, as we pointed out a couple of years ago, more boys from Eton went to Oxford and Cambridge than boys eligible for free school meals." Mr Gove appeared to draw a parallel between Mr Cameron and the 19th and early 20th Century Prime Minister Robert Gascoyne-Cecil, who is partly remembered for appointing his nephew to the cabinet. He said: "At the beginning of the 20th Century, the Conservative cabinet was called Hotel Cecil. The phrase 'Bob's your uncle' came about. It's preposterous." Mr Gove was educated at a state school before winning a scholarship to the independent Robert Gordon's College in Aberdeen. Shadow Cabinet Office minister Jon Ashworth said that the number of former Eton pupils in Mr Cameron's inner-circle was further evidence that his decisions "helped a privileged few rather than hard-working families". He said: "It's up to David Cameron who he puts into top jobs, and the fact is that the prime minister has chosen to surround himself with people just like himself. "He's leading a government that's completely out of touch." But in the same interview Mr Gove also set out why the education system was so important to him, and said that his own parents made "sacrifices" to pay for his. "Two things in particular have determined the course of my life," he said. "The first being adopted by my parents, and the second the decisions they made about schools that I went to, and the support that they gave me." He also said he would like to continue as education secretary if the Conservative Party won the next election, but admitted that he did not "have what it takes" to be the leader of his party. He said: "You've got to have that extra spark of charisma and star quality. David has it, George has it and Boris has it. "And I don't think I do. It's like if you're an actor: some people are going to be the leading man like George Clooney and there are others destined to be the leading's man best friend. Other people can be Sherlock Holmes - I'm very lucky if I can be Dr Watson." He added: "I don't have what it takes... I have seen David close up on a variety of occasions: he just has an equanimity and stamina, a sense of calm, good judgement. "The pressure of the job is phenomenal and it takes a toll on you and your family and I don't think I could do that." 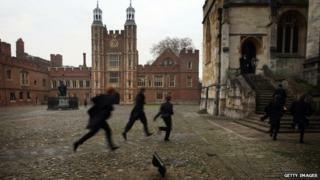 Why has Eton produced so many PMs?